Summer has arrived in Washington, D.C., and Secretary of Education Betsy DeVos is feeling the heat on loan servicing. On Monday, 150 Democrats in the U.S. House of Representatives and Senate sent a letter expressing their concern over the Education Department’s amendments to a new servicing procurement for federal student loans. In it, they highlight a host of changes in the new procurement that would “actively harm borrowers and ultimately put taxpayer dollars at risk,” including removing requirements for specially trained customer-service providers to proactively contact borrowers struggling to repay their debt. 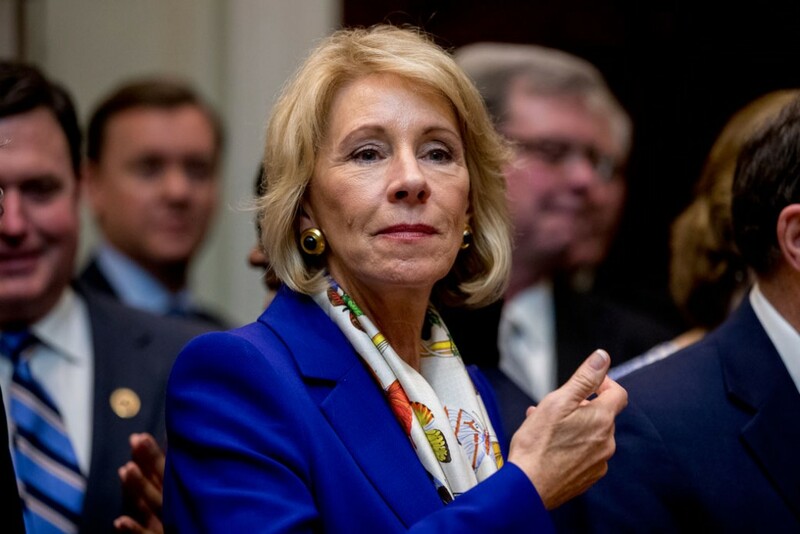 The signatories also called the move toward a having just one company service all federal education loans “extremely alarming,” noting that the department already tried and failed to have one contractor manage all Direct Loan Program accounts. Democrats aren’t the only ones concerned with a single-servicer system. Sen. Roy Blunt (R-MO) questioned the amendments in a June 6 Senate Committee on Appropriations hearing with Secretary DeVos, stating, “I’m inclined to think that that is not the best direction to go.” Last year, Reps. Virginia Foxx (R-NC) and John Kline (R-MN) noted their lack of confidence in the ability of the Office of Federal Student Aid to manage and oversee a single servicer. Their letter was sent before the Department of Education published its original requirements for the procurement in October 2016, which called for multiple customer servicer vendors that would compete for loan volume based on performance. Industry groups are also weighing in with their disapproval. The Education Finance Council (EFC), an industry group that represents nonprofit and state-based servicers, said in a statement that having one servicer “would create a monopolistic environment with little to no incentive to ensure the single servicer provides the highest quality of customer service to student loan borrowers.” EFC suggested that the department could ensure consistency in a multiple-servicer environment by publishing a “common operations manual,” something the departments of Education and Treasury and the Consumer Financial Protection Bureau recommended last year. The National Council of Higher Education Resources, which represents many for-profit loan servicers, also questioned the lack of competition in the new procurement. It’s unclear how Secretary DeVos will respond to these criticisms—or if she even understands what the contract amendments mean. In a hearing with the Senate Appropriations Committee last week, she noted that “the process was already moving toward a single servicer.” While the procurement before the amendments were introduced did stipulate a single contract, it required multiple customer service subcontractors to service accounts, so it was not, in fact, a one-servicer system. She also conflated a single platform, the system through which accounts are managed, with a single servicer, the entity that manages the details of the account, stating that having “four different servicing platforms” made it “much more complicated for students.” In actuality, most students only interact with one servicer and platform, and the original procurement had already called for a single servicing platform that would make it simpler for students to repay their debt. And while DeVos touted the single servicer’s ability “to engage a wide variety of contractors to work with,” the amendments hamstring the department’s ability to choose and manage those subcontractors, ultimately putting borrowers at risk. At the end of the day, the Trump administration has bungled an issue with a high level of bipartisan support for reform. The backlash that has ensued since the amendments were published on May 19 highlights the Department of Education’s failure to work with stakeholders—including those in the loan servicing industry—to develop a comprehensive, borrower-focused loan repayment system. With the top post at the Office of Federal Student Aid vacant, it is unclear how the process will shape up in the months to come. It is up to lawmakers and the public to continue to push back against the administration’s jeopardization of 32 million borrowers and nearly $1 trillion in outstanding loan debt.